A self taught artist and graphic designer, Naveen Shakil Khan is a female creative whose work is a cocktail of graphic, traditional and surreal art topped off with a hint of street graffiti grunge. After graduating with a Bachelors of Architecture (*Distinction) in 2009 from the University of Dundee, Scotland, she moved to Karachi, Pakistan for just under a year, during which she worked for Tariq Hasan Architects, one of Pakistan's leading architectural practices, drawing young creative minds from all over the country. It was then that her talent, in both critical thinking and representation skills were recognized. She was an integral part of the design teams, and though among the youngest, her out of the box thinking and skilled hand at graphic visualization, quickly earned her responsibilities beyond her years. In August 2010, she moved to Australia to work with the world renowned Grimshaw Architects, where she spent the next few years refining and advancing her skill set and design repertoire. At Grimshaw, she gained exposure to a wide range of projects at different stages of the design and construction process. Her work covered diverse sectors including rail, airports, commercial building, tertiary education and masterplanning. She contributed to the success of Maribyrnong Defense Site Masterplan and Brisbane Airport Masterplan; both of which were competitions and are currently under construction. Naveen was also part of other project teams including 664 Collins Street ($100m commercial building, Melbourne), Docklands 5b & 6 Development (competition for the masterplan and development of 3 buildings for $500m, Melbourne), Bulawara Road Residential Development (concept design for $30m project, Sydney), and the Melbourne Airport SkyBus Kiosk Proposal. It was the unplanned move back to Karachi in 2013 that forced her to take stock of her battling internal dialogue, resulting in a marked shift in the dynamics of her professional career and her art. It became apparent that her urge to be creative spanned beyond architecture. Perhaps there would always be a constant shift in paradigm between art, architecture, and graphics, where each element informs the other and neither can exist as a sole entity; giving birth to a symbiotic union rather than the exception to general practise. Having yielded to this epiphany, she began to embrace all forms of creative visual stimulation, resulting in a layering process for her own work. She joined Studio Subtractive, a boutique architecture and design company. Working as a Designer and Graphic Artist for Subtractive offered her a platform to excercise her graphic and art skills to create large scale graphic murals for various projects. During this time, Naveen also taught at the Indus Valley School of Art and Architecture. In 2014 Naveen moved to New York City where she secured the title of a Senior Graphic Designer while continuing to pursue her artwork simultaneously. She has worked for leading fashion brands like Vince Camuto, Anne Klein, BCBG as well as leading retailers like Saks Fifth Ave, Macy's, JC Penny to name a few. Her experience further broadened whilst working for Estee Lauder Companies. Naveen has subsequently been published nationally and internationally in magazines of note including in New York Artists Magazine, published in Dawn, OK! Pakistan, The Karachi Voice and Unique Pakistan. Her work has been displayed at national and international exhibitions including the Karachi Arts Festival, GLLAM Gallery in SoHo NYC, Full Circle Gallery in Karachi, Miami Art Expo, "SELF FESTIVAL" at the Venice Biennale. Being self-taught, she has the ability to work independently of constraints and doesn't feel the need to conform to any particular technique or medium. Her ability to not be trapped within boundaries has gifted her with the drive to work on a range of projects. 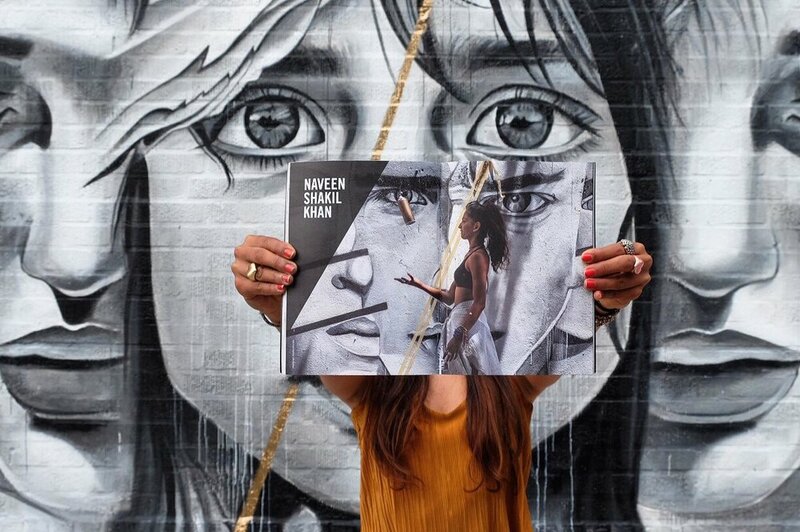 From advertising campaigns for chic brans to guerrilla and graffiti art, Naveen has employed her well versed skills in traditional painting, graphic mediums, software manipulation, mixed media and photography to her body of work. Her current output is a manifestation of all her strengths into one portfolio; her infatuation over the human form; the cleanliness of her technical execution; the diversity of her aesthetic language; and her symbiotic relationship with realism and surrealism; to create a series of powerful visual compositions. Naveen continues to live and work in New York City.